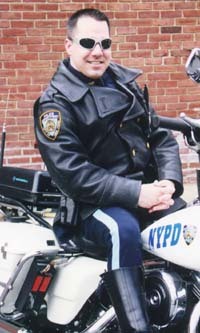 From Doug, a NYC Motorcycle Policeman "... I had ordered a pair of your glasses a while ago, ... I just want to thank you for the wonderful glasses, when I wear these glasses, I can't even tell that they are on my head. I have been using them for 1 year now and they have held up to the abuse that I have given them. I also use them on my personal Harley, and I have to say.....the WOMEN love them....HA HA. Well again thank you for the wonderful glasses. I will be ordering another pair soon. PS....I have enclosed a pic of the glasses at work." "Love the new glasses! Just got home from the A.C.R.C benefit ride for children with AIDS, as always, the glasses got a lot of comments and worked great! Spent half the day showing the benefits of my new interchangeable lenses. You have a great crew working for you!" Very well made, good wind deflection." 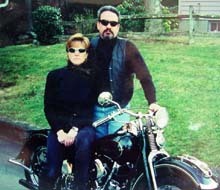 Scott and Kathy from Southbridge Mass, say "Never ride without them." Scott says they are the only sunglass he wears. He says they look great with his 37 Knuckle, and can't wait to try them on his soon to be restored Flathead. At 54, I have been riding most of my life and put a lot more miles on motorcycles than cars. The IBEAMS are great, never had any others come close. They are as good as most goggles that I have owned at keeping wind out and very light to be so strong. They will be worn most on my Sturgis trip this year." My eyes didn't water at 120 mph and I left my buddy in my mirrors! The glasses worked great! " Glasses work better without a windshield on my bike. Great Glasses! " I like that fact that you can change the lenses so you don't have to carry 2 sets of glasses for night & day riding. " Best wind protection I have ever had for motorcycling! " Keeps wind out for contacts while skiing or motorcycle riding "
Perfect for me, No Windshield! " Just keep making a quality product, you'll do very well. " I've always had a problem fititng glasses. These fit my face GREAT!! " Very Impressed with product! " They fit very comfortably, the service was excellent! " Most comfortable sunglasses I've ever worn! " A bit pricey, but you get what you pay for! " GREAT PRODUCT! VERY HAPPY! Thanks!" I'm very, very pleased! I've always had a tough time fitting glasses to my face until I found IBEAMS®. Thanks!!" Best glasses I ever have owned." Excellent product... these glasses are definitely very well made." I was impressed by the style, comfort and how lightweight the frames are. Also with the snug fit! "